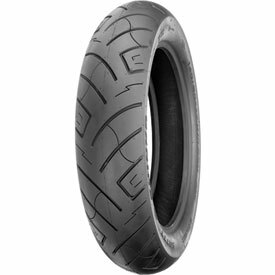 The 777 motorcycle tire was designed for mileage and performance without the high price tag. A staggered, positive ration tread pattern ignores highway rain and provides excellent wet weather adhesion. Excellent choice for cruising or touring. Only have about 200 miles on this tire. Did outstanding on grooved pavement, didn't appear to want to track the grooved and a very smooth ride. Will buy again and have. Just purchased new set of Shinko tires for my 1800 and a new rear tire for my 1300. Seems like a great tire, I like the looks of it, way better handling than the stock Dunlop tires. Great price, would have given 5 stars but RMATV sent me a tire with a 2016 mfg date code. I mounted it anyways as its not too old, and I was about to take a trip, just wish it would have been a 2018 date tire like the rear they shipped me. Didn't take much weight to balance it either. I am very pleased. They handle well, good cornering and can't beat the price. Now just to see what kind of milage I can get out of them. Great tire...Great price...Great service...what more can I ask for? I matched this with my 170 Rear Tire on my Nightster. Was huge improvement over the stock Dunlop. Would buy again. The Shinko tires on my 2007 Honda Shadow look great & perform outstanding. For the money one of the best values out there. what is the psi rating for this tire?